The eighth album by the Swedish metal masters is their most accessible to date, but still acknowledges their early sound. Over the last decade, Gothenburg, Sweden's In Flames have played a major role in the evolution of modern heavy metal. The co-progenitors of what came to be known as the "Gothenburg sound", In Flames, At the Gates, and Dark Tranquillity all brought a strong sense of melodicism to the highly technical, pummeling form of death metal that emerged from the late-1980s. While their fanbase has grown considerably, especially in the last five years, they remain largely a cult favorite in North America, while lesser talents from the exploding American metalcore scene brazenly mimic the style In Flames helped create, most not coming close to matching the power of In Flames' body of work. The venerable metal veterans have the respect of the metal community, but that has yet to translate into strong North American sales. A perfect example of that conundrum is their appearance on the 2005 Ozzfest bill: sure, it was great to see them given a chance to showcase their great talent on the main stage, but being only allowed 20 minutes to perform, while hacks like Mudvayne and Black Label Society were given time slots that ran more than twice as long, was hardly the best way to sell their product to the kids who were new to their music. 2004's Soundtrack to Your Escape was maligned by many, but was actually the band's biggest seller to date, a strong transitional album, as the band continued to delve more into accessible vocal melodies, chord structures that bordered on industrial, and churning drumming that had skeptics unfairly affixing the "nu metal sellout" tag. Now, with a new, hotly anticipated record, and a new label giving the band an unprecedented push, the hype machine is in full gear. 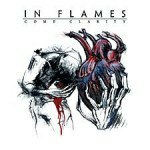 In Flames remain determined to make a serious dent, sales wise, and the very strong Come Clarity deserves to be their long-awaited commercial breakthrough. Much fussing and fretting has been made by longtime fans over the band's abandoning of the melodic riffs, dual guitar harmonies, and propulsive double-time rhythms that became their trademark early in their career, and while Come Clarity doesn't mark a complete return to the sounds of 1995's The Jester Race, it nevertheless bridges the gap between Soundtrack to Your Escape and the early albums effortlessly. Those who love the band's knack for incessantly catchy choruses amidst the chaos will find that several of the new songs are their strongest melodic tunes to date. "Take This Life" explodes out of the gate, driven by Daniel Svensson's furious drumming and the tight staccato riffs by Björn Gelotte and Jesper Strömblad, as the versatile Anders Fridén delivers impassioned lead vocals, shifting from a death growl to melodic singing in an instant. The robotic "Leeches" continues the band's fascination with incorporating electronic influences in their music, the soaring chorus trouncing the recent Fear Factory album, while "Reflect the Storm" achieves the perfect night/day, catharsis/introspection combination that young metalcore acts would kill for. The startlingly gorgeous, acoustic-tinged title track has crossover appeal written all over it, and is a nice departure for the band, but the real trump card here is the fantastic "Dead End", which has Swedish pop star Lisa Miskovsky sharing lead vocal duties with Fridén. Sure, it's the same kind of "beauty and the beast" formula that countless goth bands drag out, but it's a formula that always works when in capable hands, and the enticing dimension Miskovsky adds to the In Flames sound works so brilliantly, the band should hire her permanently. It's not until midway through the album that the band focus more on winning over the old fans, and the sheer muscle of the last half of the album is every bit as impressive as the more melodic first 20 minutes. "Vacuum" is a perfect epitome of the meeting of old-school In Flames with the newer version, those much yearned-for guitar harmonies offset by Fridén's singing during the chorus. "Vanishing Light" and "Pacing Death's Trail" are blue-collar head-bobbers that revisit the old sound and both "Versus Terminus" and "Crawl Through Knives" show how the duo of Strömblad and Gelotte remains the band's greatest asset. Only does "Scream" stumble, as the otherwise effectively aggressive song is marred by some of the hokiest lyrics the band has ever written, culminating in an almost laughable "You scream! We scream!" chorus that has us wondering if the guys had ice cream on the brain, but it's only the smallest of distractions, a rare pebble in a pile of gems. Come Clarity is a small triumph, their strongest album in a good five years, and by finding a comfortable middle ground between the old and the new, yet continuing to allow their music to evolve, In Flames have proven the doubters wrong again.